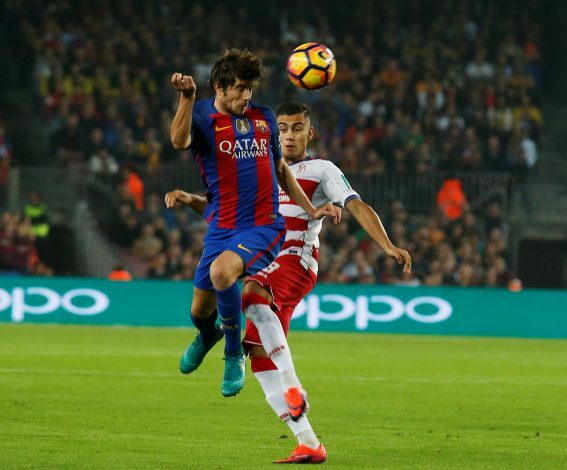 Premier League arch-rivals Manchester United and Chelsea are all set to battle it out in the quest to sign versatile Barcelona right-back Sergi Roberto. According to Spanish outlet Don Balon, both sides are willing to pay the £36m release clause in order to add more depth in their squad. It will now be up to Roberto to choose between the two big guns in European football, as he seeks guarantee from Barcelona for a regular spot in the side. Besides a role as a right-back, Roberto can operate as a winger and a defensive midfielder. The youngster enjoyed a good season with Barca last term, and started 39 games in all competitions, netting one goal and chipping in with six assist. It was reported a few days earlier that United manager Jose Mourinho has contacted the Spaniard, and that the latter is keen to play under the former Real Madrid manager. United have a number of options both in defence and midfield, so it will be interesting to see if the Portuguese utilises him as a winger. Roberto wants assurance from new Barca manager Ernesto Valverde on whether he will get enough game time this season, as he feels chances could be hard to come by. Valverde is looking at other options, having already pursued Arsenal right-back Hector Bellerin, who seems put at the Emirates. Meanwhile, Chelsea boss Antonio Conte is dissatisfied with the depth of his current squad, having already told the press earlier this week that he is on the lookout for more additions. The former Juventus manager regards Roberto as a vital player for the Blues, and can use him as a solid back-up.